In this installment of Tips & Tricks, we want to show you the multiple ways that you can access your Shopping List. Once you have created and customized your Shopping List, it is time to go shopping! If you ask me, this is the best part. I know my list is made up of the ingredients that I need, it’s organized in a way that makes shopping easier, and I don’t have to spend my time in the grocery store trying to come up with meals for my family. Have you been there? “I have this protein..(left side of the store) and what veggies…(front of the store) that means I need this seasoning…(last row… 8 rows from where you are). I love that my list makes my trip to the store less of a circus. The first way that you can access your list is by printing it. Simply use the print button in the top right corner of your list and you will view your list preview. In this preview you can make additional changes such as: including the recipe key, printing your stores on different pages, and you can even customize the text size. After you have made changes, click print. 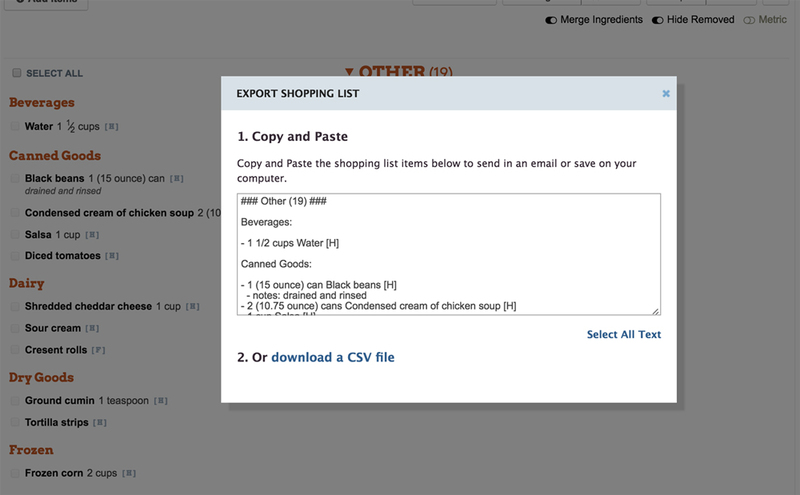 Instead of printing, you can choose to export your list. This allows you to copy your list as text to use in email or any text software. Simply copy the text and paste it wherever you would like. In this dialogue box, you can also download the .csv file of your list for use in spreadsheets software such as Microsoft Excel. Lastly, you can access the mobile version of your Shopping List on your phone. 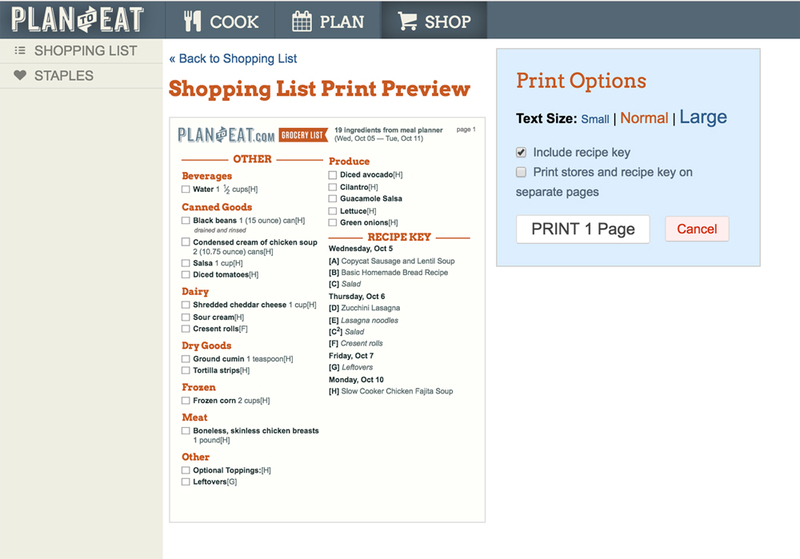 To access the mobile list, direct your browser to www.plantoeat.com and login to your account. Once inside, navigate to your Shop tab to view your list. Once you are viewing your list, double check that it is set to the correct date range and make any updates as necessary. The mobile list option allows you to easily check items off of your list while shopping in the store. If you are shopping in a store with minimal cell coverage, you can preload your list on your phone before going inside. This will allow you access to your list without internet! With your list organized exactly the way that you want it, and now in the format of your preference, you are ready to go shopping knowing you will get everything you need!